Mahalakshmi is an American-born singer and composer. 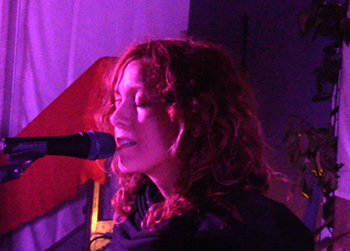 She is a bhakti and nada yogi who has written and performed music for nearly twenty years. an Avatar of Shiva who taught to live by the precepts of Truth, Simplicity, and Love. Babaji taught to repeat the Names of the Divine, "Japa Naam,"
specifically the MahaMantra "Om Namah Shivay"
in order to focus and purify the mind to realize God. a practice called "karma yoga". as well as kirtan, mantra, and poetry in Hindi. more substantially through sound than any other medium. which she then translated to piano and voice. and fully expressed her innermost self which was otherwise unmanifest. and mysteriously, the lyrics often contained wisdom guiding her way. reported having profound experiences like recalling repressed memory and emotion. The music served as an intiation into deeper relation with one's inner experience. what music can open the door of the Heart?" invariably all the music of the heart and soul. where she became aware of the ineffable effect of reciting and singing mantra. Mahalakshmi came to Goa and began learning Indian Classical music with Rahimat Khan. She is a student of Indian classical vocalist Geetika Varde who is based in Mumbai. and in Emam and Mahalakshmi's band Rhythm and Mantra internationally. Turkantam (guitar), Julien Moretto (violin), and Xavier Peres (piano). on two albums dedicated to healing. 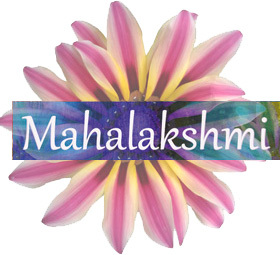 Mahalakshmi currently resides most of the year in India.